Two things I'm really trying to work on this year are: using less plastic and saving more money, so trying to make as many of my lunches and snacks for work and university seemed like a pretty good place to start. When I'm at work or studying, I tend to get really snacky, so I like to make sure I've always got some healthy and filling snacks on hand to fight off the hanger and, when an apple just won't do the trick, energy bars are my go-to. These no bake cherry crumble bars are the ideal sweet treat to make on a Sunday afternoon and store in the fridge so you've always got easy access to a healthy, delicious and plastic-free snack that's sure to satisfy your cravings and give you plenty of energy! Start by lining a brownie tin with a sheet of baking paper. Then combine your oats and cinnamon in a bowl. Add your pitted dates to a blender or food processor along with the water and pulse until smooth. Transfer your dates to a bowl and combine with your maple syrup, peanut butter and almond milk. Then combine your wet ingredients with the oats and stir well until fully combined. Press your oat mixture firmly into the brownie pan, then place in the freezer to firm. Whilst the oats firm, slice all of your cherries in half, then add to a pan along with the coconut sugar, chia seeds and a splash of water and simmer until reduced and thickened. Once thickened, remove your oats from the freezer and spread your cherries in an even layer over the oat base and sprinkle with a handful of flaked almonds. Place back in the freezer for around 2 hours to set, then slice into eight equal pieces and transfer to an airtight container to store in the fridge. Perfect for lunch boxes, healthy treats and afternoon snacks, these cherry crumble bars are the perfect sweet treat to accompany a cuppa. 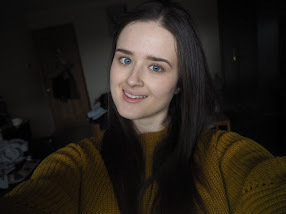 I'm Ciara, a 21 year old recent English Literature graduate from the University of Leeds. Here on Ciara's Corner, you'll find plant-based recipes, fitness, cruelty free lifestyle, travel & more!